The biggest lesson in the 2008 elections would have to be that public office is truly available to anyone (anyone, that is, except Ralph Nader). This has been as evident on the national level as it has at the local level. After slogging through thousands of words of answers to simple questions, this reporter has discovered there are many single-issue candidates, and some candidates who seem grossly unprepared to represent the various communities they seek to serve. Each candidate received a survey with six or seven questions to reveal their personalities as well as their politics, and we later asked them to show up for a photo shoot—together. That request was easier said than met. New Times learned that some races are so heated, certain candidates won’t even stand next to each other long enough for a picture. And mudslinging isn’t reserved for the big-time politicos. During the past few weeks, New Times has been deluged by anonymous letters, hushed phone calls, and sleazy packages, all aiming to smear candidates in local races. Most of the “tips” turned out to be completely unfounded, to boot. Not all of the candidates liked our questions. More than one candidate asked, “Why are you wasting my time?” or essentially told us to go to hell. In all, about 40 candidates responded to the survey. New Times does not endorse any candidate, but we hope to make your choices easier. In San Luis Obispo, six candidates are vying for two seats on the City Council, and two candidates are running for mayor. Dave Romero is currently the mayor of SLO and is running for re-election. Romero is retired, but spent 36 years as the public works director in SLO. Terry Mohan, is a delivery truck driver and community activist. He’s running for mayor. Paul Brown is currently a council member, and the owner of Mother’s Tavern. Jan Marx is a former council member, and is a land-use lawyer. Dan Carpenter is a retired business owner, and planning commissioner. Marcia Nelson is a fresh face on the political scene, and a stewardess. Arnold Ruiz is also running for the council, but could not be reached for comment. What principles of development or planning have guided (or would guide) your decisions concerning growth in SLO? Please give one example. Dave Romero: My decisions concerning growth in SLO are guided by the City General Plan and the Downtown Concept Plan. The General Plan calls for a residential growth rate of 0.5 percent per year or less—a rate slower than the County or State. During my 6 years as mayor our city has grown at a rate of 0.4 percent per year. Terry Mohan: I advocate family-oriented working-class infill housing developments, preserving designated historical structures, opposition to mega-developments, and not gauging all city planning on the maximum profitability for the developer and tax revenue available to the city. Paul Brown: I would prefer that we grow using our existing footprint. People live and visit here because of our lack of sprawl. We need to maintain and expand the open-space buffers surrounding our city. In order to do this, we need to intensify the use and density of the downtown while still maintaining our local charm. Jan Marx: My decisions concerning growth are guided by principles of “smart growth.” As I use that term, it means keeping a compact community footprint and rejecting pave-and-sprawl development based on fantasies of cheap oil and energy abundance, an infinite supply of land and unlimited natural resources. Smart growth, by contrast, is based on energy efficiency, alternative transportation and renewable resources. It is not about turning our downtown into a mini-Manhattan, but about allowing it to become more dense without causing traffic problems, environmental damage, or loss of historical character. Smart growth is not “no growth,” but sustainably paced growth, which respects and enhances our quality of life. See my website www.janmarx.com for more information. John Ashbaugh: I’m an advocate of smart-growth principles for development, like those embodied in the Ahwahnee principles. These principles emphasize compact, walkable neighborhoods where housing, jobs, shopping and cultural activities are all integrated and accessible by foot, bicycle and transit. Dependence on automobiles is limited, to the maximum extent possible. Our current land use and circulation elements of the General Plan were last updated in 1994, and the comprehensive process of data-gathering and public participation that led to that plan was initiated in 1988—more than twenty years ago! The 1994 plan was very far-sighted, and most of its policies and principles are still very applicable, but an update is long overdue. Dan Carpenter: As a planning commissioner for the city, I follow our General Plan guidelines, and we approach growth at a very moderate pace. Our guidelines make sure that we have a balance of commercial and residential development to meet the needs of our growing community. We are mandated by the state to take our share of growth and we have been very conservative over the years in staying under that amount. I believe we can continue to maintain the quality of life we all enjoy with good policies that provide reasonable, moderate growth. Marcia Nelson: The principles of development or planning that would guide me exist in the current General Plan: zoning, compact urban design, mixed use, and compatibility with the area regarding architecture, height, etc. Many people opposed the Downtown Centre years ago, but it has become a hub of shopping, entertainment, sidewalk seating and a convenient pass through to more businesses. Our parking structures are so attractive visitors have difficulty locating them. I am excited about the Village at Broad. It will provide more affordable housing, a convenient distance to walk downtown, attractive design and improve a currently blighted area. 2. Where do you see the city in five years? Ten years? Dave Romero: In five years the seismic retrofit will be completed, resulting in a safer and revitalized downtown. Many projects and developments throughout the city now in the approval stage will be completed, adding to the charm, ambience and vitality of our city. In 10 years, much of the outlying housing, shopping and interchange improvements now planned will be completed, making SLO the jewel of California cities. Terry Mohan: Following the current course of planning in five years I see it to be struggling financially and in 10 years losing its attraction to tourists and those looking to relocate as another Anyplace, California. With policy changes and new, innovative leadership we could maintain the city’s financial well-being and appeal. Paul Brown: In five years we will have completed the earthquake retrofits in the city and the Land Use Element update. In 10 years, hopefully we will have enough parking structures downtown to take public parking off Higuera Street, widen the sidewalks, and make the city more pedestrian-and-bicycle-friendly downtown. I fear, however, it will probably take longer than 10 years to realize that vision. Jan Marx: San Luis Obispo will have become more sustainable and affordable in the next five to 10 years. The community will have embraced principles of smart growth and reduction of carbon footprint, and the city council will have done so as well. We will have updated our Land Use and Circulation Element accordingly. City government will work with Cal Poly, local businesses and non-profits to implement green-building, transportation, and local energy-purchase and production programs and to grow green jobs. Bicycles, small electric cars, and electric shuttle buses will be the primary form of in-town transportation for residents. People will be able to shop in small neighborhood stores, where locally produced food will be readily available. The city budget will balance, and market conditions will have made housing more affordable. We will have come closer to completing our greenbelt, and the downtown will be economically vital and pedestrian friendly. Marcia Nelson: Initially I thought the city budget expenses would increase 2 to 3 percent each year. But, due to the rollercoaster state budget, binding arbitration, and cost-of-living estimates, I have increased my estimate to 5 percent. This means the city will need to increase revenues by implementing cost-effective spending to generate revenue for the city and provide jobs. In addition, cost-cutting measures must be proactive. Every city department needs to decrease spending; i.e., tax use of fire ambulances, mandate 4 to 5 non-paid days off for all non-essential employees, raise fines for public drunkenness. 3. How would you address the affordable housing shortage in SLO? Dave Romero: In recent years the city has adopted many programs to encourage and require construction of affordable housing in SLO, however high land cost, slow-growth policies, high city fees and high construction costs severely restrict the number of units that are actually constructed. For what it is worth, the current financial crisis is creating housing that is more affordable. Positive actions the city council can take are to protect mobile home parks from converting to other uses and zoning additional property near Cal Poly to apartment zoning. Terry Mohan: Stop the conversion of family apartments into condos without replacement. This is against our municipal code. Reinitiate the equity controlled George Moyland housing on Humbert Street squelched by the city council. Use city housing funds to contract for single level family duplexes instead of the sardine can condos now being constructed. Add more restrictions on professional property owners to allow families to be competitive for neighborhood housing. Paul Brown: We need new construction to be affordable by size and design rather than mini-mansions on ranchette-sized lots. Also, by encouraging Cal Poly to continue to build more beds on campus, we will have less pressure on the housing rental market. This allows the rentals in San Luis Obispo to be more affordable to working families and less enticing for real estate speculators. Jan Marx: More on-campus housing now in the pipeline will liberate more city housing for people who work here, and will bring down rents, citywide. The city should create a manufactured-housing (mobile home) zoning ordinance, and plan how to best provide this type of affordable housing, which is an essential first step into the housing market. John Ashbaugh: First, we must recognize that housing affordability remains a problem in this area, even with the collapse of the “bubble” of high housing prices that has caused our current financial crisis. We will soon be updating the city’s housing element of the General Plan, helping us to understand the scope of the affordability problem—always the first step in attempting to solve any problem. Second, we should take steps to ensure that more land within our major expansion areas—particularly Orcutt Area Specific Plan, with almost 1,000 homes—is available for affordable housing. I have taken a leadership role on the Planning Commission in encouraging a significant commitment to affordable housing in the Orcutt Area. Third, we should systematically review the fees that we charge currently, and those we are about to impose, on new housing—whether it is in the Orcutt Area or individual secondary dwelling units that are infilling our existing neighborhoods. Dan Carpenter: We continue to address the affordable housing shortage in our everyday planning as staff, planning commissioners and elected council. We encourage development to provide this much needed housing element in our city, and have made progress in addressing this with affordability by design. Keep in mind that property values and cost of materials are high and the continued likelihood of affordability becomes harder and harder to achieve. Marcia Nelson: I would address the affordable housing shortage in SLO by encouraging higher density projects, apartments, and protection of mobile home sites from unfair conversion. 4. How do you balance personal beliefs against public input? Dave Romero: My core beliefs and values have been instilled in me by my loving family, my birth date prior to the start of the Depression, and my 50 years of service to SLO as public works director, council member and mayor. My decisions always carefully consider public testimony, and General Plan documents. Every decision I make reflects what I feel is best for the long-time benefit of the city. Terry Mohan: Verify the public input and compare it to my belief. If I find that my belief is not accurate I am willing to adjust my opinion. I am open to compromise. Paul Brown: I balance personal beliefs against public input by sitting back and looking at whether the decision (or the precedent being set by the decision) will make San Luis Obispo a more functional city 20 years from now. Jan Marx: On city council, I base decisions on the greatest good for the greatest number. Being clear about my personal beliefs is essential. I generally agree with the residents. For instance, if I had been on council when the issue of paving part of Mitchell Park came up, my beliefs would have been consistent with the recommendations of all three advisory boards and the majority of the public input. I would have voted against the paving, and for creating greater access for seniors and planning a new senior center with adequate parking. John Ashbaugh: I believe that true leadership requires genuine listening to the public, but there are times, too, when a leader must point the way to problems yet unseen, and toward solutions that may require sacrifice, difficult choices, and a direction that may be unpopular. Politics is, however, the art of the possible, according to Aristotle. I hope never to face a situation where my fundamental core values conflict with my responsibilities as an elected official; if I ever find it impossible to carry out the public will in a manner consistent with my conscience—I would resign my office and return to private life. Dan Carpenter: I do this by acknowledging that as appointed and elected officials, we represent almost 45,000 people in our community and must set our personal beliefs aside for the betterment of the majority of the people. A good balance of using General Plan guidelines and public collaboration continue to be the best combination for success. Marcia Nelson: My personal beliefs are balanced by the fact that public officials are bound by the laws and regulations of their city. I would closely monitor the input of the public and those affected before making my decisions. 5. What do you mix with vodka to make a cocktail? Dave Romero: I think 7UP goes well with vodka, but I haven’t a clue how to make a vodka cocktail. Paul Brown: It depends on what type of cocktail you want. To make a martini, take a dash of dry vermouth, swirl it around the glass until all inside surfaces are covered, shake all excess vermouth from the glass, add chilled vodka and an olive or other garnish if desired. For a kamikaze, pour three parts vodka, two parts triple sec, and one part limejuice into an ice shaker, shake, and then pour. For other cocktails, most juices will work with vodka. Milk, however, is not a good idea. Jan Marx: Orange juice in the summer and spicy V-8 in the winter, but I favor local organic wine. John Ashbaugh: Only Glen Starkey, to my knowledge, uses ONLY vodka to make a cocktail. How unimaginative! My favorite cocktail recipe is top secret—but if any of your readers want come to my victory party, I’ll share it with them. They’ve got to stay sober, however, long enough to volunteer for me. Dan Carpenter: I don't mix anything with vodka, as I don't drink. Marcia Nelson: What I would mix with vodka to make a cocktail would depend upon what was available at 35,000 feet. 6. Do you have an iPod? What is in your top five most listened to songs? Dave Romero: I do not have an iPod but often listen to my collection of John Denver songs on my compact disc player. Terry Mohan: I have my daughter’s hand-me-down iPod. I wear it when I jog. I currently find the Dixie Chick’s CD, Taking the Long Way, motivating. Paul Brown: I don’t use an iPod, but my five favorite songs are: “Home”, Talking Heads; “San Antonio Rose”, Bob Wills and the Texas Playboys; “Peel Me a Grape”, Diana Krall; “What’d I Say” Ray Charles; “Ain’t that a Kick in the Head” Dean Martin. John Ashbaugh: I have an iPod Touch loaded with an unlikely mix of classical, jazz, New Age, rock, and NPR podcasts. Unfortunately, my 95-year old mother gave it to me, and she rigged the parental controls so that I can’t play anything contemporary. My two daughters (Laura, 20 and Anna, 23) occasionally send me Chumbawumba tracks to play, out of pity. Dan Carpenter: No iPod. Favorite song— Imagine (John Lennon), and all oldies! Marcia Nelson: I have an iPod but listen to an eclectic group of CDs, which now includes: Chocolat, Madeline Peyroux, Frieda, Il Divo, and Cat Stevens. 7. Have you volunteered with any organization recently? Which one? Dave Romero: I am a member of the Rotary Club, a service club that continually volunteers for civic projects. I have recently been involved in the construction of Eto Park, refurbishment of the Continuation School grounds, construction of the Mitchell Park Bandstand and the Jack House Fence replacement. I have contributed toward the Children’s Museum and the Railroad Safety Trail near Cal Poly. In addition, the Rotary club supports MANY civic, county, national and international causes. Terry Mohan: I’m president of the Black & Gold Boosters at SLO High School. [I’m] a twice-monthly platelet donor at the blood bank. [I’m also] an usher, bell ringer and donut server at the Old Mission. Paul Brown: Yes, I regularly volunteer time with many organizations in the area. Over the last year I have volunteered with the Grizzly Youth academy, the Senior Nutrition Program, the Economic Opportunity Commission, the American Legion, the Literacy Council, Jack’s Helping Hands, and the Women’s Shelter. Jan Marx: I have chaired my Rotary Club’s first official “Clean and Green” Project, raising funds from the community for the “Missing Link” of the City’s Railroad Safety Bicycle and Pedestrian Trail connecting Cal Poly to the Downtown. This is a 500-foot section along the railroad track, parallel to California Boulevard between the north side of Foothill and the border of Cal Poly (See www.rrtrailfund.org) The enthusiastic support from students and the neighborhood for this project has caught the attention of grant-giving agencies and construction on the Missing Link is scheduled to start soon! John Ashbaugh: I’m the original “can’t say no” volunteer in any organization I join—and that includes the SLO Morning Kiwanis Club, the Santa Lucia Chapter of the Sierra Club, and even the PTA when my kids were in elementary school. Dan Carpenter: I continue to volunteer with my church (Old Mission Church), as I have my entire life. We have many programs that reach out into the community, including supporting the homeless shelter, Prado Day Center, care facilities, and prison ministries. I have helped with the Special Olympics, Boy Scouts, youth sports, and many others in the past. Marcia Nelson: The organization I most recently joined is “Airline Ambassadors.” Our group of flight attendants escorts children to and from third-world countries to the U.S. for specialized surgery. 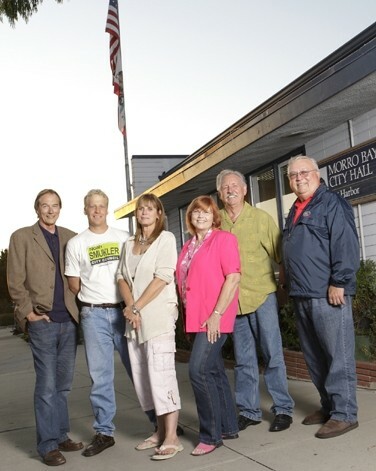 MORRO BAY : Two candidates are running for mayor in the Morro Bay election, and four candidates are running for two seats on the city council: (left to right) Roger Ewing, Noah Smukler, Carla Borchard, Janice Peters, George Leage, and Bill Peirce. Four candidates are running for two seats on the city council, and two candidates are running for mayor. Janice Peters is currently the mayor, hoping to stay there for two more years. Roger Ewing is a retired photographer, is chair of the Public Works Advisory Board, and is running for council. Carla Borchard is the owner of Carla’s Country Kitchen and a member of the Chamber of Commerce, who is running for council. Bill Peirce is a member of the council. 1. What principles of development or planning have guided (or would guide) your decisions concerning growth in Morro Bay? Please give one example. Janice Peters: In Morro Bay, the challenge is to maintain our small town character while still approving projects that will benefit the community. We’ve encouraged commercial and residential mixed-use projects in our downtown area, and one such project is nearing completion on Morro Bay Boulevard. In residential areas, we had a group of citizens concerned with “mansionization” (huge homes being built on small lots that are changing the character of the neighborhoods). We held a series of public hearings and the Planning Commission is currently working on building guidelines to address the issue. George Leage: Slow growth. Nature teaches us that things change over time, whether we want them to or not. So, "no growth" is not a realistic vision. Nor is it fair to our great grandchildren who should have their say in their time. Disruptive development is also unrealistic because it puts us at odds with how we see ourselves. Recent proposals for development on the Embarcadero illustrate disruptive development that is sure to run into a firestorm of public resentment once our citizens realize the implications. Roger Ewing: Regarding residential growth, putting neighborhood compatibility first to eliminate oversized houses on undersized lots. Regarding commercial growth: the more the better in the appropriate zone. Noah Smukler: I am a strong supporter of building/planning techniques that have positive influences on the livability of our neighborhoods and the quality of our environment. I will work to create an incentive-based program so that projects incorporating low-impact- development and smart-growth principles are recognized for their reduced impacts to our public infrastructure and environment. I have been a leading organizer of the Surfrider, Sierra Club and SLO Green Build “Sustainability Socials: Appropriate Technology Presentations”, which have included the topics of: Rainwater Harvesting, Biological Water Treatment and Watershed Restoration. Carla Borchard: Focus on downtown and the waterfront. Reward innovative and sustainable design. Bill Peirce: We have updated our General Plan and our zoning ordinances. They are great improvements over our existing rules. However, they are still at the Coastal Commission awaiting review. They’ve been there for years. George Leage: I've seen our city for more than 50 years. Change has been very gradual and I am comfortable with that. I just can't stand to see us drifting backwards like we have in recent years. I'd like to see our fishing industry back on its feet and our tourist economy become better developed within the next five years. In 10 years I'd like to see the existing power plant either replaced by the new smaller one or torn down if that is not possible. My platform is "use it or lose it" with regard to the plant. The power plant has ceased as an energy producer, and in its place the city will be in the process of partnering to redevelop that property as a commercially viable entity. The tertiary sewer treatment plant is newly complete and operating. Our city budget will be in much better shape due to increased eco-tourism. The power plant redevelopment has come to fruition. Water reclamation is an added feature of the sewer treatment plant. For sure, the public swimming pool is complete and in regional demand. Noah Smukler: The quality of our local economy and natural resources will influence the future of our community. My focus will be to guide Morro Bay toward an abundant future that sustainably balances the needs of our environment, economy and residents. My five-year vision includes a framework to encourage low-impact development and green infrastructure concepts within all projects and a refocus on the local economy so that in 10 years Morro Bay is a leading destination for travelers from around the world to experience the coast and enjoy locally grown food, artwork, and manufactured products! Carla Borchard: If things keep going the way they are? Possibly bankrupt. We need to work toward rebuilding our commercial property tax base. Bill Peirce: I see a city that has survived its economic hardships. I believe we can increase tourism by encouraging mid-winter businesses conferences. I think our “Eco-tourism” theme will entice an increasing number of visitors, and I think we will be able to encourage commercial development to bolster our business community. 3. On a scale of one to 10, with 10 being optimum and one dire, rate the health of the ocean and estuary. Janice Peters: The Morro Bay National Estuary Program prepared a report on the health of the estuary, and the overall conclusion is that we are aware of the challenges and responding to them well. Our reports on the ocean are usually good, although there are incidents where the water quality is affected during storm run-off, etc. Generally, our environmental care and awareness keep us in good shape, so my rating would be an eight. Roger Ewing: The Government lists our estuary as an impaired body of water. With the power plant still functioning, the estuary is suffering a continued degradation of resources. According to a series of articles in the Los Angeles Times, the ocean isn't any better off. However, locally with new methods of fishing being used and stricter State-required water pollution discharge standards, our local ocean waters have a good chance to improve from an already better than average health. So I currently rate both a six. Noah Smukler: The following efforts can be made: decrease urban and ag runoff by promoting best management practices of the built and natural environments; replacing the use of chemical fertilizers, pesticides, herbicides, and pharmaceutical drugs with non-toxic alternatives; and recycling water from our waste-water treatment plant. These actions will improve the health of our marine environment and promote a sustainable local fishing economy. Carla Borchard: Seven to eight. Bill Peirce: I would rate the ocean at a six and the estuary at four. The estuary will be healthier when Los Osos finally gets a working sewer system. Janice Peters: I try to balance them with rather than against each other. Voters elect us because our beliefs or opinions are similar to theirs, but once elected, we have a duty to represent all citizens fairly. It’s important to realize that most people are only aware of the proverbial tip of the iceberg, while elected officials continually receive huge amounts of information from staff, research and other sources. Our job is to study all that material and then balance it with public comments to make reasoned, long-range decisions for our community. A current example is our new roundabout, which was a controversial issue. I received a lot of criticism for approving it, but now, before the new paving is even complete, it’s working so well that I’m getting calls and e-mails thanking me for supporting it. George Leage: Value public input where it is appropriate. We are also answerable to the law. We are a town of 10,000 citizens with only a handful involved in the governing process. Leaders are supposed to study harder and then think of the common good for the town and all of its citizens before making decisions. Sometimes this can be unpopular, but a good leader should be willing to take a little discomfort when they are certain they are doing the right thing for our community. Noah Smukler: A little quote from the Tao te Ching (#59): “For governing a country well there is nothing better than moderation. The mark of a moderate man is freedom from his own ideas.” In decision-making, I am willing to listen to all perspectives and am excited to engage the residents and businesses of Morro Bay in a collaborative effort to identify our priorities and realize our full potential. Carla Borchard: We need to remember that we are voted into office by the public to serve the will of the people, not our own personal interests. Bill Peirce:Public input trumps personal beliefs. Janice Peters: I don’t drink vodka, but whatever it’s mixed with, it should be shaken, not stirred. George Leage: I'm not a vodka drinker. Roger Ewing: If it's Grey Goose ... nothing! ... Well, maybe an ice cube or two and a lemon peel. Noah Smukler: Fresh-squeezed organic, locally grown orange juice. Carla Borchard: Pomegranate juice and lime. 6. Do you have an iPod? Janice Peters: No. My days are full of talking and activity, so I find silence relaxing. If I had one, the songs I’d listen to would be ones I could sing along to … country and show tunes. George Leage: No iPod, but my cell phone has some fun rings –and it has been ringing a lot lately. Roger Ewing: No ... and I haven't paid attention to a "top 5, 10, or 40" list of anything in years. Noah Smukler: No iPod … favorite radio stations include KCBX 90.1 fm, KVEC 920 am, and Cal Poly radio (KCPR 91.3) which I listen to while surfing my website: www.vote4noah.com. Carla Borchard: Yes. “Let’s be us again”, “Already there”, “Write a letter to me”, “My town”, “I melt”. Janice Peters: Both Morro Bay and Los Osos/Baywood Park Chambers of Commerce, and I’m currently serving on the County Animal Services task force committee. George Leage: I helped raise money for our local Rotary's community organizations fund at our recent Harbor Festival. Roger Ewing: Yes ... Morro Bay Beautiful, Friends of the Morro Bay Library, and I am currently the chair of the City's Public Works Advisory Board. Noah Smukler: I was the chair of the San Luis Bay Chapter of the Surfrider Foundation, the Estero Bay Community Garden Club and am currently the vice-chair of Morro Bay’s Public Works Advisory Board … all rewarding experiences! Carla Borchard: 4-H, Morro Bay High School Boosters, and the Chamber of Commerce. Bill Peirce: I always carve turkeys for the city’s Thanksgiving community dinner. I’ve done it for years. I also “volunteered” to be a chess piece in the “Chess Live” performance for the Harbor Festival. PISMO BEACH : Two candidates are running for mayor, and three candidates are running for two city council seats. From left to right: Mary Anne Reiss, Ed Waage, Ted Ehring, and Bill Rabenaldt. Wayne King is not pictured. 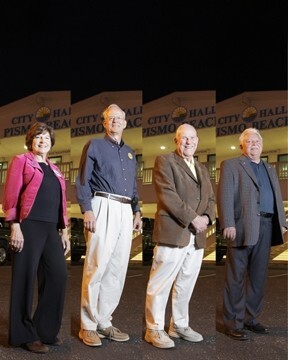 In Pismo Beach there are two candidates running for mayor, and three candidates running for two city council seats. Bill Rabenaldt is a city council member and is running for mayor. Ed Waage is vice chair of the planning commission. Ted Ehring is an incumbent on the city council, as well as a geologist, general contractor, and member of the planning commission. Wayne King did not participate in the survey. 1. What principles of development or planning have guided (or would guide) your decisions concerning growth in Pismo Beach? Please give one example. Mary Ann Reiss: The San Luis Obispo Council of Governments is developing a Community 2050 plan that is a collaborative partnership working toward a regional Sustainable Communities Strategy for the Central Coast. I subscribe to these principles as they take into consideration land use, transportation and our environment. These principles will give us more livable communities. Mixed-use, for example, can be a place where people can live and work. Bill Rabenaldt: Updating the General Plan is most important. Pismo Beach is one of the last small beach towns on the coast of California. We can either become another Manhattan Beach or make a concerted effort to maintain what we already have. Ed Waage: I serve on the Pismo Beach Planning Commission where we follow the planning guidance of the General Plan and the planning codes. I have always made decisions that I felt were in the best interests of the city. We have to manage growth so that we maintain our small- town character but allow some revitalization to occur, especially downtown. We approved a project recently where there will be a mix of residential and commercial. Some of the commercial will be live/work where the owner will live above the office space. This cuts down on commuting. I am also an advocate for conserving our resources. My wife and I installed solar panels on our roof a year ago and we have generated 100 percent of our electricity during that time. We need to see where there are opportunities to encourage others to go solar in the city. Ted Ehring: The principle of planning that currently guides me for the growth of Pismo Beach is that I wish to retain the small-beach-town character of Pismo. Furthermore, any developer who wishes to annex to the city must come with his or her own natural resource (water) and provide for the enlargement of the sewer facilities, major connecting roads, provisions for schools, and show fiscal neutrality. Mary Ann Reiss: Five years: fiscal integrity: We need to continue to be financially strong with adequate reserves. We are in a strong position with $3.1 million in reserves; however, this will continue to be a top priority. We need to build upon our strength in tourism, fight for local control relative to the State and explore diversification of revenue sources. well-maintained streets: The condition of city streets is a visible sign of a community’s quality to its citizens and visitors alike. I want to see recent progress on rebuilding our streets continue into the neighborhoods. attractive and vital downtown: Maintain the small-beach-town character while continuing to revitalize and continue improvement of traffic circulation and parking issues. Work with the Shell Beach Improvement Group in developing a specific plan for the Shell Beach area and explore how to connect downtown and Shell Beach shopping. Promenade IV: Acquire funding and complete promenade IV from the pier to Main Street. General Plan update: Hold visioning workshops and complete the General Plan update. Bluff erosion and ocean water quality: Geotechnical study of shoreline is completed and a plan of action formulated. Ocean quality study is finished—sources of pollution identified and a plan of action is in place. Old civic center site: A plan is in place to guide future re-use and proper rehabilitation or rebuilding of the site. [Completion of a] wastewater treatment plant conversion to allow for water reclamation to irrigate while saving potable water. Community assets: Price historic park in collaboration with the county will be a regional park. Dinosaur Caves Park will be in the finished stages. Pismo Creek and Pismo Creek Trail will become greater attractions. Pismo Beach and Shell Beach Veterans Hall are key assets and will require the proper attention and upgrading. Workforce housing: Workforce housing should be in place. Under-grounding of utilities: Use Title 20 funding and other sources in collaboration with residents and commercial development to complete under-grounding wherever possible. Price Canyon: Sphere of influence will be expanded, constraints analysis completed and ready for exploration of future annexation. Look at possibility of golf course and conference center. Bill Rabenaldt: In five years we should have long ago decided on a plan for our future. In 10 years, Pismo Beach will be the place to visit but we will not be able to accommodate the masses. Reservations will be needed in advance to visit our community. We should not have an explosion of growth to make room for visitors as the state's population grows. This is our town first and guests are welcome but not by the millions. Ed Waage: One of the problems we need to address is our infrastructure. We have some additional sales-tax revenue so we can repair additional roads, storm drains and shoreline bluff tops. I hope that we would have solved most of those problems during the next five years. I also see some additional development in the downtown especially where we have more people living downtown year round so that we have more vitality there, especially in the off-season. Over the next 10 years, my crystal ball is a bit more cloudy. Ted Ehring: In the next five years under the present economic conditions I would expect a 1 to 1.5 percent increase in growth. The Grossman Medical complex will be constructed and Loughead development may have some homes built. Ten to twenty units of workforce housing will be built and the twenty-four lots on Price Canyon within the city limits will be developed. Ten years from now the city limits will be built 95 percent built out. Possibly the first annexation of property into the city will be developed. A new hotel the Boardwalk will have been built and the center of downtown will be a plaza. Mary Ann Reiss: I believe it to be a seven—health warnings seem to have lessened. Bill Rabenaldt: The ocean water quality is unacceptable, three. I’m anxious to find the results of the study that is taking place. With over five million gallons of treated sewage being dumped into the ocean each and every day by south-county cities, this may end up being the culprit or a large portion of the overall contamination. Ed Waage: I would rate it a three. The cause of the pollution is currently being studied by Dr. Chris Kitts of Cal Poly and the results might hopefully provide a solution. There seems to be a correlation of pollution with spring tides, those tides with higher than usual run-up on the beach. The results are preliminary however. Ted Ehring: The entire bay is about a four. The only reason that other locations do not have higher readings of bacteria counts is that they are not tested. 4. What do you mix with vodka to make a cocktail? Mary Ann Reiss: I prefer a nice glass of pinot noir. Bill Rabenaldt: I no longer drink so I mix nothing with my cranberry juice. Ed Waage: I prefer a glass of wine from any of our fine Central Coast vineyards. Ted Ehring: I do not drink vodka cocktails therefore I have no idea what to mix it. 5. Do you have an iPod? What is in your top five most listened to songs? Mary Ann Reiss: No – I don’t have an iPod but I wouldn’t mind having one. I like classical music and oldies but goodies. Bill Rabenaldt: old-time rock and roll, Beatles and “Revolution”; “Footloose”, “Panama”, “Me and Bobby McGee”. Ed Waage: I do not have an iPod, but I am tech savvy since I have been programming computers for over 40 years. In my music taste, I have always enjoyed Mozart as a composer and can listen to his music any time. My wife and I spent a year in Vienna, Austria and had a chance to hear his music at small venues as well as the Vienna Opera House where we enjoyed The Marriage of Figaro. Another of my favorites is “The Magic Flute”. Outside of classical music, I enjoy the ‘60’s and ‘70’s music. Ted Ehring: I do not have an iPod. I listen to country western music when I turn on the car radio; otherwise I very seldom listen to the radio. 6. Have you volunteered with any organization recently? Which one? Mary Ann Reiss: I am a Rotarian and also do fund raising for YMCA, Boys & Girls Club, Big Brothers Big Sisters, and muscular dystrophy. Bill Rabenaldt: “Battle of the Bloom”, First Presbyterian Church fundraiser. Ed Waage: I volunteer for the American Red Cross, the San Luis Obispo Emergency Communications Council, and I have served as a precinct captain during elections. 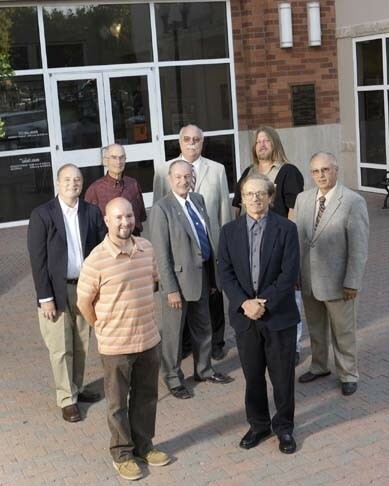 I also serve on the Pismo Beach Planning Commission. 7. What should be done about the pigeons? Mary Ann Reiss: I think we have done it. Prohibition of feeding the birds has eliminated bulk feeders and the population has thinned. Bill Rabenaldt: They seem to be under control since the mass feeding has stopped. I’m in a holding pattern until we get definitive results on our ocean quality study and to see if the population stays within acceptable limits. Ed Waage: As mentioned above, Dr. Kitts of Cal Poly is studying the pollution problem and it is too soon to point any fingers at the cause. Since the study involves DNA analysis, the results should provide some clues as to the specific causes so that we can try to solve them. Ted Ehring: If the current scientific study to classify DNA of poop determines that pigeons are the cause of occasional high bacteria counts off the Pismo Beach Pier then they should be removed. GROVER BEACH : Two candidates are running for mayor, and three candidates are vying for two seats on the city council. From left to right: Debbie Peterson, Chuck Ashton, Karen Bright, and John Shoals. Liz Doukas is not pictured. John Shoals is currently mayor; he is running for re-election. Liz Doukas is court reporter, running for city council. Debbie Peterson is a realtor and member of the planning commission, running for council. Karen Bright is an incumbent city council member running for re-election, and a former planning commissioner. Chuck Ashton is on the Grover Beach City Council, running for mayor. 1. What principles of development or planning have guided (or would guide) your decisions concerning growth in Grover Beach? Please give one example. John Shoals: I am an advocate of strategic growth, which calls for infill development on vacant or under-utilized lots, housing in proximity to retail, transit and public facilities, and the preservation of agriculture and open space. The Grover Beach General Plan encourages mixed-use (retail and residential) development in strategic locations along West Grand Avenue. The council majority has approved several mixed-use projects close to Ramona Garden Park. For example, a mixed-use project was approved at the corner of Ramona and 10th Street close to Ramona Garden Park and the newly constructed South County Transit Facility. Development projects must be consistent with the General Plan, zoning code and development standards. Based on community input, these documents should reflect community values relating to growth, land-use types, and design qualities. I have consistently supported projects that comply with city standards even when it has not been popular with some members of the public. I believe if a land owner/applicant is willing to invest in our community, research our requirements, and comply with all applicable city standards, city decision-makers should honor the General Plan (“which is our word”) and approve the project, if fits into the neighborhood or meets the vision. Consistent decision-making insures that we are being fair and objective, and not subjecting the city to needless lawsuits. Liz Doukas: My most ardent wish for Grover Beach is quality, architecturally sound developments, whether they be residential or commercial. We've approved too many what I call "cement block" buildings with no outstanding unique features or style of design—I speak at planning commission and city council meetings about this all the time—they have the final decision to turn anything down that doesn't meet this higher standard to raise the bar of local development. We also need to keep our eye on water issues and overdevelopment. High-density projects should be limited and not the norm. The best example is Beach Place on West Grand Avenue; it's close, but could have used more outstanding features. Debbie Peterson: Our little town is 2.25 square miles with no room to expand beyond our boundaries. Our development, therefore, is based on infill of vacant lots and re-development of older units. We will have to consolidate lots in order to bring in commercial or retail developments of any significant size. A wonderful example is the consolidation of several smaller lots by enterprising local business owners on 9th Street back in the 1960s. These owners, led by a local businesswoman, bought several lots and then approached Carol Pruett of Mid-State Bank and asked him to build a bank on 9th Street and Grand Avenue. That Rabobank at 9th Street and Grand Avenue is a wonderful addition to our community. I would like to see community property owners work together to bring businesses to town that will bring additional income to our town to help finance infrastructure improvements. I have consistently encouraged this in the 10 years I’ve lived here. Karen Bright: The Grover Beach General Plan and Vision Statement. Chuck Ashton: I have experienced many of the situations that face Grover Beach in my past history, been-there, done-that scenario. You don’t need to reinvent the wheel to accomplish progress. I’ll draw on my past experience. I was involved in developing a downtown central business area, which we sorely need in Grover Beach. John Shoals: In five years, I see Grover Beach with substantial public improvements and upgrades generating private investment. We are making tremendous progress with the Grover Beach Lodge with conference facility, infrastructure upgrades, the train station expansion, reconstruction of the Meadow Creek Bridge, the South County Transit Facility in the downtown, and pedestrian/bicycle improvements along Grand Avenue. These public investments should lead to private development of retail, offices, and housing in our community. 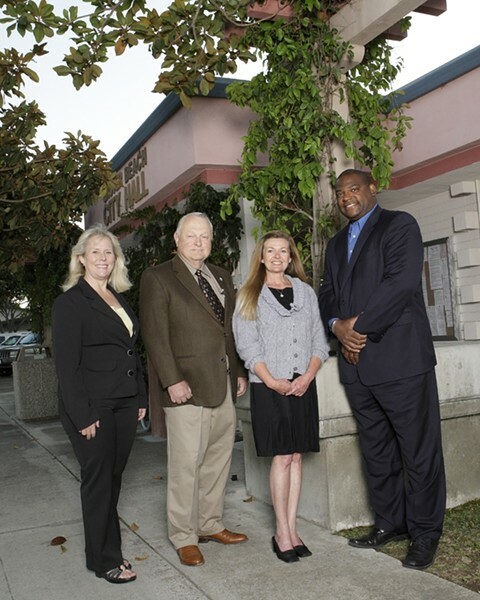 Grover Beach will begin to realize its potential for investment and improvement. We must have sound economic policies and standards that will put Grover Beach in the best possible position when the economy turns around and people have discovered Grover Beach. In ten years, I envision Grover Beach being the cool coastal community where young professionals, working families with children, and active seniors interact and socialize in the downtown and as a destination for coastal visitors. Public safety will have been greatly improved with consolidated fire and police services able to respond in an effective and efficient manner to community demands. People from other parts of the state will no longer ask: Where is Grover Beach? Liz Doukas: We are a growing community that in five years will make great progress, in 10 years we'll be where we need to be with viable businesses and a great tourist destination that we have to work hard today for and put plans in place. We are slowly going in that direction but need better council guidance to get us there—and that would be me. I am not a politician, just a very concerned citizen to put into place and implement the wishes and desires of our people who have tried for so long to be heard above the roar of outside developers. Debbie Peterson: Five years: We will have a beach front lodge, beach front condo hotel, Hilton Garden Inn, and have made inroads in attracting businesses to locate in our industrial area. Our streets will be in much better shape because of the bed taxes and hotel taxes generated by these businesses and applied in our community. In 10 years I’d hope to have another three large hotels and at least 50 percent of our industrial area developed so that we have ongoing income to keep up our infrastructure and develop our beach village. I want to have a pedestrian-friendly safe area on Grand Avenue with bike trails connecting to nearby towns and to the boardwalk, sidewalk cafes on Grand, and an active tourist connection between our train station, hotels and beach front village. By 10 years we should be in a position to have a new city hall in place. Karen Bright: Emerging as a true destination city with a financially healthy, pedestrian and family friendly village-type downtown; with a realistic plan for our future water needs. Ten years? An environmentally responsible, bustling beach town that offers: head of household jobs; affordable housing for all social and economic levels; a downtown where people of all ages and diverse economic levels live, work, shop, and gather; a first-rate industrial area; while maintaining our small town atmosphere. Chuck Ashton: This question is asking one to look into a crystal ball during difficult economic times. I will strive to maintain our residential integrity as a beach community, opposing intrusions to change it. I also see a strong downtown business area developing that will provide the needed capital for infrastructure improvements. 3. What new goals do you have for the Grover Beach? John Shoals: 1. Complete the Beachfront Lodge with conference center and continue economic development; 2. Revitalize the Grand Avenue corridor with mixed use buildings, slowing down traffic and installing pedestrian and bicycle amenities; 3. Expand the train station into a multimodal center with trains and buses; 4. Secure funding for construction of Phase 2 of the Ramona Specific Plan, which includes a pedestrian plaza similar to Mission Plaza in San Luis Obispo 5. Develop a senior center near the exploration station, community library, and the South County Transit Facility at Ramona Garden Park; 6. Work with service providers and agencies to find a permanent home for the People’s Kitchen and develop a South County human resources center; and 7. Explore ways to better utilize the fiber-optic facilities in our community. Liz Doukas: My number one goal is street and infrastructure repair that has been too long overlooked by our city leaders—we must make it our number one priority. My goal, through budgetary doggedness, is to put $1.5 million per year, every year until we get back to square one—no bonding of citizens—and to accomplish that amount of work every year. Unless and until we dedicate ourselves to that goal, we shall continue to fail. Debbie Peterson: We are a friendly, quiet little beach community. Some have called us “Mayberry” and I sometimes refer to us as “Kansas at the Beach”. I want to see us improve as outlined above while retaining our quiet neighborhoods and relaxed beach atmosphere. As revenue accrues from redevelopment I’d like to see us pay our police and fire officers on a par with surrounding communities. Karen Bright: Save our old-growth trees and initiate a Heritage Tree ordinance; look to new ways to encourage and reward use of sustainable building materials and water retention, percolation, and ground-water recapture methods. Chuck Ashton: An old goal that has been neglected over the years is the development and improvement of South 4th Street, which represents the southern gateway to our city. I also propose to make changes on Grand Avenue by reducing speed, improving lighting, and introducing diagonal parking. John Shoals: I put community benefits before my personal views or beliefs. The first questions I always ask in reviewing a project or proposal is whether it is good for the community. I also place a high value on public input in the decision-making process. One of the primary jobs of the mayor and city council is to represent the interests of the public. I only interject my personal views if I believe the council is heading toward a decision that is inconsistent with the community vision, unfair to the property owner, or compromises the public’s health, safety and welfare. Liz Doukas: Very good question. We all have life experiences that determine the decisions we make every day. I wholeheartedly believe in the voice of the public and what they have to say, the residents who have lived here 10, 20 30, 40 years. Last night at a planning commission meeting, many members of the public stood up to say a particular development will cause quality-of-life issues, i.e. traffic, noise, congestion, questionable requested variances for the project to make it, and when that many people come out to speak out about an issue, that carries a lot of weight. Debbie Peterson: My personal beliefs are broad enough to encompass public input. For instance, I believe that as an elected official it is my job to seek out and listen to public input and then act based on my research and knowledge of the issues and laws relating to the issues. There is no conflict between listening and acting in the best interests of the city. I will never vote against my conscience even when my vote may be unpopular or unexpected. Karen Bright: Review each public item with an open mind, with no preconceived decision or result formulated, until all public input has been heard. John Shoals: I mix tonic with Grey Goose vodka to create a smooth drink after a long day in the office. Liz Doukas: Good friends and family, tasty food, great, interesting conversation, beautiful beach sunset--oh, and cranberry juice. Debbie Peterson: If I mixed anything, it would be a White Russian: Kahlua and cream and vodka, but I don’t drink often enough to mix them! Karen Bright: What time of day is it? Chuck Ashton: I’m a diabetic and haven’t consumed any alcoholic beverages in many years. I wouldn’t have a clue. John Shoals: Yes. Right now I am listening to India Arie, Norman Brown, Jennifer Hudson, Neyo and Lenny Kravitz. Liz Doukas: No, I do not. I can barely keep up with my software updates and keeping current in my court reporting business--Ugh!! Debbie Peterson: No. I enjoy R & B and my 11-year-old son has recently turned me on to Coldplay. Leonard Skinnard, “That Smell”; Merrell Fankhouser, “Higher Ground”; Nickelback, “If Everyone Cared”; Seether, “Fake It”. Chuck Ashton: No. I enjoy listening to most of the oldies from the 50’s, 60’s and etc. John Shoals: American Red Cross. Liz Doukas: For many years I volunteered my time chairing our local TANG committee (traffic and noise group) working with a volunteer councilperson, Chuck Ashton, and the chief of police in resolving problems around our city that citi that citizens brought to our meetings. I really, really liked that but the current council majority did away with the TANG committee, saying we had served our time. Any time citizens come forth and volunteer to help the city address issues cannot be a bad thing, and when I am elected I will re-instate any volunteer group to assist our city leaders make the right decisions for our citizens. I also attend neighborhood watch monthly. Debbie Peterson: I do a lot of work with the Rotary Club of Grover Beach. I am currently serving the Grover Beach Planning Commission and have done so for three years. I taught Sunday school for three years. I’ve recently been on the California Association of Realtors committee to set up a fundraiser to raise funds for affordable housing. Chuck Ashton: In the past 10 years, I have accumulated over 5,000 hours of municipal volunteerism in Grover Beach. Most of volunteer work in recent history has been with the Parks and Recreation Department. ATASCADERO : Six candidates are running for three seats on the city council. 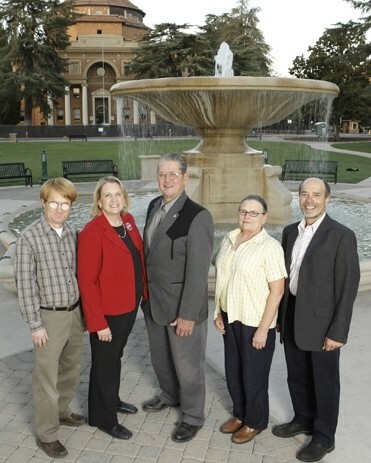 Left to right: Brett Heinemann, Roberta Fonzi, Jerry Clay, Pamela Heatherington, Len Colamarino. Bob Kelley is not pictured. Six candidates are running for three seats on the city council. Jerry Clay has served 12 years as a city councilman. Pamela Heatherington is a medical office manager and has served on numerous committies and boards including the planning commission. Bret Heinemann is a teacher and writer. Roberta Fonzi is a business owner and current chair of the planning commission. Bob Kelley is a businessman. 1. What principles of development or planning have guided (or would guide) your decisions concerning growth in Atascadero? Please give one example. Jerry Clay: I'm a pro-business councilman. The only thing that is constant is change. I approve quality projects that will be best for Atascadero. Input from the public is important. Input from political activists is less important. In the past 12 years I have voted yes on many important development projects: Home Depot, Albertson's, Hovers, the Community Center, Sunken Gardens and the Down Town Streetscape to name a few. Pamela Heatherington: As the “quality of life candidate” I wholeheartedly embrace smart-growth principles. How and where growth happen are key components to a successful community. Communities need to be pedestrian and bike friendly. I consistently vote against drive-through restaurants. They contribute to our obesity problem and diminish our air quality. Bret Heinemann: Atascadero needs a diverse, broad-based economy for financial security. This includes traditional storefront businesses from small to large. It also needs to recognize that home-based and virtual storefront Internet businesses have a role in our local economy. Alternative energy can also be a part of the future. It would allow residential and commercial property owners the opportunity to sell extra electricity to a utility company. Communitywide character education needs to be a part of our future as an extension of our building public trust program. This will allow us to focus on our common core values instead of our differences. Roberta Fonzi: As an Atascadero planning commissioner for almost 10 years, I have seen many development proposals, both good and bad. One planning principle that promotes good housing within neighborhoods is well-planned infill development. By filling in a vacant lot with a compatible design that fits seamlessly with existing development, the neighborhood and city is enriched as a whole. A good example of this type of infill is the Apple Valley residential subdivision at Del Rio Road. This development has superior architectural design, a neighborhood park, and incorporates affordable housing. It fits in well with the surrounding neighborhood and is an asset to the city. Len Colamarino: One of the problems Atascadero has is that there has been a paucity of planning in its business district for many years. On the city council, I will encourage more planning. For example, we need to start thinking of the business sector in terms of districts, and try to direct development accordingly. In that regard, I can think of three retail districts already in existence: the downtown; the central El Camino Real corridor from Highway 41 south to the plaza where Spencer’s market is; and the big-box district that has taken partial shape in the northern part of the city from Del Rio to San Ramon. The city needs to try to direct development to reinforce the presence of those complementary districts, so that each district becomes a profitable retail sector in its own right, and so that, taken together, the whole will be greater than the sum of its parts and we will have a retail district that serves all of the shopping needs of Atascadero’s diverse citizenry. Beyond that, I am committed to energetically pursuing the long-stalled redevelopment of Atascadero’s downtown district. In that connection, the city has to treat the reconstruction of the historic city hall as a development project and rebuild it as soon as possible to serve, not as another office building, but as an attraction, such as a museum, which will draw traffic into the downtown area. That is the catalyst project for the downtown, which might kick-start the Colony Square project and other development projects in the area. Bob Kelley: As a seven-year member of the Atascadero Planning Commission I participated in the rewrite of the current General Plan. I believe in the General Plan and its blueprint for the future growth and development of Atascadero. Jerry Clay: In five years the City of Atascadero will have overcome their financial crisis. The Super Wal-Mart at Del Rio is a big hit with locals and is drawing customers from every corner of the SLO County. Olive Tree, Best Buy and Red Lobster have just had their Grand openings. Colony Square has just completed their third phase. The new movie theater is a big hit and Colony Square is a countywide, respected life style center. All businesses are enjoying the customer traffic that the Super Wal-Mart and Colony Square have generated. The downtown is growing and bustling with activity. Two new hotels have just been completed and Atascadero has gained national recognition as being the tourism hub of SLO County. Chalk Mountain Golf Course is hosting its first PGA nation-wide-tour events. Our population is at 29,000 and Atascadero is still recognized for our large lots where horses, farm animals, and 4-H and FFA projects thrive. In 10 years, the school district has sold the junior high property at Lewis Avenue and built a new, state-of-the-art junior high at San Benito. Fire Station One has relocated to North El Camino. The fine-arts theater complex is near completion at the old National Guard armory property. The downtown is busting out at its seams with expansion. Commercial development at the old junior high property is in full swing and includes a bowling alley. Construction has just started on the Olympic in door swim pool at the Community Center. Restoration is finally completed on Old City Hall and the City Council is grappling as to how best use the facility. Business is booming up and down El Camino and we have still maintained our residential Country atmosphere. We lived happy there after, forever and ever. Pamela Heatherington: In five years I see a completed solar- powered “Neighborhood Theater North” at Colony Square with a few dining choices nearby. The old city hall is quickly becoming our Colony Center with theater, farmer’s market, and community gatherings galore. The Printery Building has the potential to be our historical center, museum and community library, all within walking distance of each other. In 10 years, we would be reaping the benefits of the first five years. There will be a thriving artist community. Most new construction would use our ample sunshine for comfort and power. Community gardens are available in high-density areas and every school has room for a garden for our children. Bret Heinemann: I see a community that has moved ahead and recovered from the D-08 issue. The community may still be struggling because of a weak national economy, but we will be surviving. New business will slowly fill in the empty spaces in town. The town will be united by our core values and desire to work together despite our differences of opinion. In 10 years, I see a much stronger and vibrant community working to solve the challenges of the next five to 10 years. Roberta Fonzi: In five years, I hope to see a more vibrant downtown: Colony Square Theater will be built and the downtown streetscape project completed, trees will be planted downtown, medians landscaped, and sidewalks beautified with pavers. At the Del Rio commercial node, I hope to see construction underway and businesses moving into the Annex (old factory outlet area) across the street. In five years I hope to see the city on a better financial footing. In 10 years, I hope to see the old city hall rebuilt and the area downtown bordering Atascadero Creek developed with walking paths and a pedestrian bridge. I hope to see the downtown area revitalized with cafes and businesses that will attract customers both in the daytime and in the evenings. Len Colamarino: In five years, I see Atascadero in its third successive year of operating at a fiscal surplus. The roadway and streetscape improvements made in the gateway area of the city will have made that area more inviting and impressive. The historic city hall will have been fully restored and put into productive use as an attraction, which is drawing people into the downtown area. Colony Square will be completed and the blocks surrounding the Sunken Gardens will be in the process of redevelopment by private developers buying and developing one or two parcels at a time. In 10 years, I see the area of Atascadero’s downtown west of the old City Hall fully redeveloped. I also see a quality development completed on the jewel site located in the area east of the old City Hall, which the junior high school currently occupies. There will be an architecturally coherent, environmentally friendly group of structures along the creek, with a promenade or trail coursing along the creek bank. There will also be inviting new, high-density residential developments in the downtown area north of Lewis and west of West Mall. Residents will be drawn to the prospect of living in an environment where many, if not all, of their day-to-day needs can be met by a short walk or an easy bike ride, and dining and entertainment opportunities can be found not far from their doors. 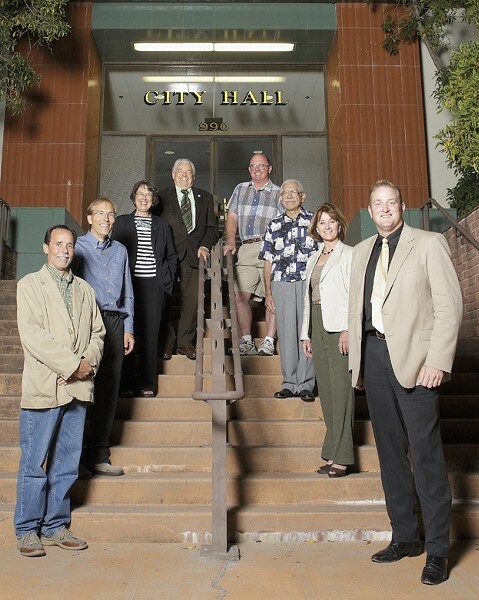 Bob Kelley: If the right people are elected to the Atascadero City Council, the city will come out of its current financial condition and will be prosperous in five years. As the city becomes business friendly and commercial growth comes to our city I believe that in 10 years Atascadero will be the most sought after city to live in on the Central Coast. 3. Do you support or oppose Measure D-08? Jerry Clay: I do not support D-08. In my opinion D-08 (The Shield Initiative) if passed, will destroy our city’s financial well-being and send Atascadero down the bankruptcy road. D-08 will shield our city from ever having financial security. Vote no on D-08. Shield our city from fixing our roads. Vote no on D-08. Shield our city from increasing the number of police officers, which is needed. Vote no on D-08. Shield our city from building a third fire station, which is needed. Vote no on D-08. D-08 will send a message to all that Atascadero is not business friendly and restricts consumer choice. Vote no on D-08. Pamela Heatherington: I support D-08. Roberta Fonzi: I oppose Measure D-08. Atascadero is in financial crisis and the City is currently living off of its savings. We need a steady source of sales tax revenue to survive; without it we will be unable to pay for services such as police and fire protection and road maintenance. Passage of Measure D-08 will limit Atascadero’s ability to attract and retain business, and it will be counterproductive to Atascadero’s future economic success. Len Colamarino: On the day that I take office, the outcome of Measure D-08 will have already been determined. That determination will have been made by the voters, and the city council will not be faced with a vote on it. As I will not be voting on Measure D-08 as a council member, and as the voters already have enough people advising them about this issue, I am refraining from presuming to tell them how to decide Measure D-08 and am focusing on what I will do on the city council. In the already inflamed atmosphere that surrounds Atascadero’s Wal-Mart controversy, the last thing needed is for another council candidate to exacerbate the controversy. Accordingly, I am remaining neutral with respect to the ballot Measure D-08. I understand the positions being taken for and against the Measure, and when I assume office I will still be in a position to communicate credibly with both sides. At that point, I hope to be able to help heal the wounds and move on. Regardless of the outcome of ballot Measure D-08, Atascadero will still be facing many pressing challenges in developing the business sector and increasing sales tax revenue. In confronting those challenges, I will represent all the voters, not just those for, or against, Wal-Mart or Measure D-08. Let me mention that remaining neutral on Measure D-08 is the path of most resistance. I am lobbied routinely by partisans on each side, and am often threatened by rabid voters with the loss of their vote as punishment for not endorsing their position on this one issue. Nonetheless, I have to do what I think is right. I do not believe that it is appropriate for me as a city council candidate or a prospective city council member to be adding to the divisiveness by endorsing either side’s position on this controversial ballot measure on which the city council will not even vote. The leadership that I offer on this issue is keeping the whole Wal-Mart controversy in perspective and planning for how to govern after the voters have decided Measure D-08. With or without a Wal-Mart Supercenter, Atascadero must come together and start projecting an image of unity to enable us to prevail in what will need to be a prolonged effort to turn around the business sector. I want to be in the best position to make that happen. Bob Kelley: I oppose the measure D-08. Jerry Clay: My only agenda is to do what is best for Atascadero. I want to find the best way, considering public input and not always my way. I believe the Council must cultivate the team concept. This has been lacking the past two years. We will get it back. Pamela Heatherington: As the “Quality of Life” candidate, my personal beliefs are grounded in our collective right to clean water, breathable air and sustainable soils. Public input, for the most part, is issue directed and should be considered in context with supporting documentation. Bret Heinemann: When it comes to making decisions, the most important issue is to be at peace with it. It's not a good thing to make a decision which most people want you to make if you're going to regret it afterwards. The best decisions are made when personal conscience, public needs and desires are in agreement. Roberta Fonzi: People are elected to public office because of who they are and what they believe. I don’t think it is possible to set aside one’s personal beliefs and to maintain one’s integrity. As a planning commissioner I have had to make many decisions. First, I always analyze the information and secondly consider the public’s input. Often, the public has a different perspective that is new and valid, providing a basis for either changing or supporting my initial analysis. Personal beliefs are always part of any decision-making, but they must also be tempered by information and public input. Len Colamarino: The great political philosopher Edmund Burke drew the distinction between the “trustee” representative and the “delegate” representative. Trustees think of themselves as fiduciaries entrusted by their constituents with the duty to exercise their judgment on behalf of their constituents in accordance with their individual consciences. Delegates think of themselves as obligated to their constituents to vote in accordance with the constituents’ views and to subordinate their own judgment. My belief is that good government requires adopting a combination of the two approaches described by Burke. I will perform my duties as a trustee, insofar as I will feel obligated to vote in a way that, in good conscience, I believe is in the best interest of the people of Atascadero, and to use my skills and judgment to the best of my ability in carrying out that responsibility. At the same time, in those instances where I know that that there is a consensus on the part of Atascadero residents on a particular issue, I will feel obligated to act like a delegate and reflect that consensus, unless in good conscience I am convinced that to do so would cause real damage to the interests of the community. That summarizes how I will balance personal beliefs against public input. Bob Kelley: Separating personal beliefs against public input comes down to character. A person with strong character will put personal beliefs and any connections with any special interest groups aside and make their decisions on what is best for the community based upon what the current rules that are in place. My record on the Atascadero Planning Commission will attest to my character when addressing public issues. Jerry Clay: Juice I guess. Pamela Heatherington: Vodka is not based on local crops. I prefer to support our local economy by drinking local wines. Bret Heinemann: Most people use orange, tomato or grapefruit juice. Some use tonic water. Roberta Fonzi: I’m not much of a drinker, so I’ll make a wild guess… how about a green olive? Len Colamarino: Vodka and other high-octane beverages are no longer on my drink list. The cocktails that I drink these days are less potent, such as Campari and soda, Kirs, or Bellinis. Certain kinds of wines I have also come to appreciate as cocktail substitutes. Cheers. Bob Kelley: I’m not really much of a drinker but I would have to mix vodka with grapefruit juice for a Greyhound (mascot for Atascadero High School) with no salt. What could be more appropriate to drink in Atascadero? Jerry Clay: What's an iPod? (joke) [I listen to] any and all Country songs old and new. Pamela Heatherington: No.Top five: Sweet Honey in the Rock “I Remember I Believe”; Brett Dennen “Blessed”; Ray Charles Genius loves compan “Here We Go Again”; Billie Holiday “God Bless The Child” Robert & Janita Baker “Walkin’ Around Lucky”. Bret Heinemann: No, I don't have an iPod. I listen to most of my music by surfing the radio. I don't have any particular favorites. In the morning I usually listen to KSTT 101.3 or KIQO104.5 or perhaps KJGG 98.1. If I listen later in the day, you might find my radio tuned to family radio, KCBX or KTEA in addition to my morning choices. Yes, it is a wide variety. Roberta Fonzi: Yes to the iPod. I like to listen to musical soundtracks from old movies such as Out of Africa, Dances with Wolves, and Titanic with a sprinkling of Johnny Cash and Journey. It’s a little weird, but it works for me! Len Colamarino: Since I don’t feel a need to carry my sounds on my person, I have not acquired the iPod habit. Internet radio, streamed into my stereo system via a Linksys Wireless Music Bridge, is how I get most of my music these days. My favorite source of audio streaming is Pandora.com, where I have created personal channels to serve my broad range of musical tastes, from classical to jazz to Brazilian to 60s rock to Sinatra. I also like Accuradio.com and Batanga.com. Bob Kelley: Yes I do have an iPod and almost any other gadget that’s out there. I like the oldies but goodies and soul music is my favorite. My top 5 are: “Can’t Get Enough of Your Love Baby”, Barry White; “Soul Man”, Sam & Dave; “Bo Diddley”, Bo Diddley; “Speedo”, Cadillac’s “Tighten Up” Archie Bell and The Drells. Jerry Clay: Community involvement and service has been important to the Clay family for the past 68 years in Atascadero. Presently I'm an active member of Atascadero Kiwanis. I also volunteer sever times a year as an auctioneer for various charity fundraisers. I have worked the junior live stock sale at the Mid State Fair for 54 years straight. Pamela Heatherington: I volunteered last weekend at our annual Atascadero Creek cleanup day. On Saturday, October 4, I pulled weeds at the Lake Pavilion for ANTA (Atascadero Native Tree Association). Bret Heinemann: My most recent volunteer work is my participation in the candidate forums hosted by the City of Atascadero and the Chamber of Commerce. Other than that, my volunteer work is limited to family, friends, and my church. Roberta Fonzi: I serve on the Atascadero Veteran’s Memorial Foundation and have for the last three years. The foundation has designed and raised the funds to construct a memorial at Atascadero Lake Park, raising over $300,000 by selling pavers, serving food at barbeques, and addressing groups and individuals. The project is almost completed (we are currently laying the pavers) and it will be dedicated on November 8 at 10 a.m. It is a worthy memorial to the San Luis Obispo County veterans who have served and given the ultimate sacrifice. Len Colamarino: The Small Business Development Corporation. Bob Kelley: I’m a 19-year member of the San Luis Obispo County Sheriff’s Aero Squadron which is made up of volunteers through out the county. Our mission is aerial search and rescue. I am also the co-coordinator for the organ-transplant flights that the squadron makes. To this date, we have made 25 to 30 flights, which provided transportation for county residents to receive organ transplants. There are four candidates running for mayor in Paso Robles, and another five candidates competing for just two spots on the city council. Gary Allen Nemeth is a retired police officer and has served on the city council. He is running for mayor. Jim Norman is a marketing consultant, running for mayor. Fred Strong is running for reelection to the city council. Nick Gilman is an architect, and has served on the planning commission for nine years. He’s running for city council. Ed Steinbeck is a realtor and has served on the planning commission. Donald Fransen is a small business owner. He’s running for city council. Daniel Franklin is running for city council, but declined to participate in New Times’ survey. 1. What principles of development or planning have guided (or would guide) your decisions concerning growth in Paso Robles? Please give one example. Gary Allen Nemeth: People—Develop people to power the knowledge economy that will provide a full range of educational opportunities. We must increase community and business investment in, and commitment to education. Knowledge is power. Place—Improve the quality of place that will attract investment and knowledgeable workers. [Do this] by establishing distinctive, quality, stable, safe and sustainable, physical improvements and attractions [to Paso Robles] that welcome all, and will maintain and enhance our quality of life. Positioning—Develop and market the unique character, heritage and special attributes that make Paso Robles one of the most desirable locations to visit and live. John Borst: “Development as freedom” is a key principle or perspective to bring to the table when making “growth” decisions. Indeed, freedom is both a basic element of development and an enabling key. For instance, democratic freedoms allow our citizens in Paso Robles to have a voice and a constructive role in shaping community values and norms. These freedoms, including freedom of expression, discussion and the right to cast a ballot vote, are not only pivotal in inducing governmental responses to actual economic needs, they are also central to planning for the future. A practical illustration of “development as freedom” is my stated position at a recent candidates’ forum, that is, “people should have a right to vote on planning decisions.” I was the only candidate of the 4 running for mayor to take this position. In short, we need to grow better by cultivating the blessings of liberty. Growing bigger is an illusory governmental aim for any free people. Fred Strong: Many things: the city’s General Plan, state mandates and regulations, sustainability, balanced mix of types and affordability, city and natural resources and quality of life issues as seen by the proponent, city staff, stakeholders and citizens at large. I was involved in the selection of the planners for two annexation areas and the two plans on the west side of town. I supported, and we selected, a nationally renowned firm with allied disciplines that stressed traditional neighborhood design including smart growth principles with respect for property rights, environmental sensitivity, sustainability, and total community involvement through the charrette process. While there are still different opinions, the bulk of issues were addressed rapidly and considerations covered a broader range of topics than usually occurs. Community acceptance was facilitated and the initial presentations elicited excitement and anticipation within the community. A quick example: While chairing the planning commission in the early 80's a very pro-development policy had overloaded east— west traffic circulation. We recommended a building moratorium to the council pending circulation improvements. The moratorium was not imposed, but the process began which built the Niblick Bridge and other improvements. Ed Steinbeck: I am for reasonable growth. By this I mean growth that follows our adopted policies, has the services, utilities, and facilities needed and that covers its own costs. I believe changes in the General Plan must be carefully weighed against the delicate balance of available services. The City must have some residential growth to remain an economically viable community that has a balanced job base. We need to carefully encourage new commercial growth that will provide increased sales tax to fund needed services. We also need to encourage new job growth as recommended in the adopted Economic Strategy. Donald Fransen: Development should be focused in the downtown corridor. Creating more density results in less infrastructure cost. Thereby promoting commerce, business, and community from within. Gary Allen Nemeth: The adopted 2003 General Plan provides a blueprint that in general terms gives a direction until 2025. We have also adopted several specific plans, Town Center and the Uptown Plans are looking at the future for the next 3-4 decades. The Salinas corridor plan provides direction also for at least that same period of time. I believe five to 10 years is too short a period to look into the future. My belief is, that as mayor, planning for the future of Paso Robles is what is important; the plans that I have mentioned take us well into 2030 and beyond. By looking forward it provides the community a real chance to plan their future and become actively involved in helping grow Paso Robles for their children and future generations. John Borst: I see the current city council members and/or candidates for mayor being too influenced by developers and/or traditional notions of growth. If I ,or other like-minded people, do not seriously cultivate the blessings of liberty, and more actively exercise our freedoms, I expect the city to be a lot bigger, but not any better. If the current developmental trend in our city continues, I expect the quality of life for citizens in our community to be continually degraded. The traffic problem in our city I believe is a tell-tell sign of things to come. Jim Norman: I think that the city is in a mix of good and bad. We need to remember that we need to work together. Fred Strong: The current economic situation has cast a different light on my crystal ball. I believe we are setting in place those things that will reduce difficulties and improve quality of life in the long run. However, the short run depends on the methods used to address the economy by federal and state efforts over the short run. If the approach used is similar to the 1930’s we can expect to spend a considerable amount of our time securing federal and state projects to improve our infrastructure and resource delivery systems with economic stimulus grants and programs. These could include useful efforts regarding highways, roads, bridges, public and mass transit, water and sewer, resource conservation, energy production and delivery as well as low-income and workforce housing projects. The difficulty in that scenario is maintenance of local control over design and placement so that the character of the community is not severely impacted. Once the economy begins to approach normalcy, I see a greater effort to be frugal and sensible in our approach to transportation, jobs/housing balance, conservation of natural resources, and a less wasteful life style. [This includes more] neighborhood shopping opportunities and better connectivity for all forms of transportation along with more mixed-use structures and neighborhoods. Outdoor recreation could be better integrated into our mobility lifestyle as well our health efforts. Local government’s role will be to enable these things, not mandate them. We must provide the mechanisms for them to happen on a voluntary basis and provide the services necessary to sustain them as they occur. Compactness in the core of the city and each neighborhood with more affluent opportunities, without being wasteful, on appropriate landforms will be a key to good planning designs. Neighborhoods must become more self sufficient in a variety of opportunities and services to reduce the necessity of trips to the central core or major shopping centers for small but necessary daily purchases. Resource conservation, including energy, will have to become an integrated part of our lifestyles by choice if our quality of life is to be sustained. Does that answer a five-year, 10-year timeline? I think it is a flow from now into the future for five, 10, 20 and 50 years. Some things we can affect locally, others are more difficult … but not impossible. I will keep my eye on the prize and go for it. The prize is leaving this world a better place than I found it. Nick Gilman: Paso Robles’ eventual size and shape will be limited by water availability. This is a good thing, it allows the city to limit approvals only to proposals that truly fit our policies and goals. With the economy in it’s current state, predicting short-term development is too difficult. Ed Steinbeck: I believe the city will grow slowly residentially over the next five years. We are projected to be in the low to mid 30,000-population range by then, but this economy may result in less construction than expected. Over 10 years we should expect growth consistent with General Plan guidelines and the recommendations of the Economic Strategy. Commercially, we will continue to be the preferred commercial area in the north county and the visitor sector of the economy will continue to grow. We hopefully will see more head of household jobs through our encouragement of businesses wanting to locate here. Donald Fransen: In five years, I see the city catching up on needed/required infrastructure repair and replacement; streets, sewer and water delivery, our wine and tourism industry surpassing Napa in both quality and popularity, our equestrian event growing likewise. In 10 years I see the implementation of new water resources, advancements of the uptown plan, and the wine industry advance as a leader worldwide. [Also] a prison re-entry facility, growth at the airport business park, and a few more growing pains: state and federal agencies will continue to throw new law and regulations at us, for compliance at any cost. We are stuck with how to get them done, and how to pay for it. 3. How do you balance personal beliefs against public input? Gary Allen Nemeth: The decisions I am required to make are based on seeking out and listening to community wants and goals. I do my own background and research into the various topics. As mayor I will hold a public meeting and after listening to everyone I make the best decision for the majority of everyone that lives in Paso Robles. My personal beliefs do not enter to my decision-making; I believe that I truly serve in the best interests of all citizens in Paso Robles. John Borst: Grow democracy. Give people the right to a ballot vote on issues of community wide concern. Jim Norman: Honesty, open-mindedness, and willingness. Fred Strong: You don’t. Public input is a portion of the process of developing personal opinions. Beliefs are reserved for the unexplained and unexplainable. My belief in God in not dependent on proof or reason it is either belief or non-belief. Nick Gilman: In Paso Robles public input is taken very seriously. We have seen relatively small pressure groups able to have questionable policies adopted by persistence and zeal. Public input must be evaluated for its depth and overall community support. Even broad community consensus, however, must be evaluated against personal experience and judgment. I feel a Council member should vote according to his personal best evaluation. Ed Steinbeck: I would characterize myself as one who is well prepared, one who will listen to all sides and then make a decision based on adopted policy tempered with my convictions and what I have learned from others. I have learned to be a good negotiator in my business by looking for a win-win position for both sides. When that is not possible, I advocate strongly for the person I represent. At the Planning Commission level, I try to facilitate a decision, listening to staff, the public and my fellow commissioners. At the regional level, I have a basic understanding of SLO COG and the workings of the County Planning Department and have developed contacts at that level. I have attended various meetings hosted by Cal Trans and have met some of the staff. I am familiar with and understand the issues that I would face as a City Council member. Donald Fransen: Use common sense, keep an open mind. Gary Allen Nemeth: As a police officer, who has served 30 years in law enforcement and having been selected to investigate all major injury and fatal accidents in the City of San Luis Obispo, (a college city) I responded to too many tragedies that were alcohol related. I made the decision that for me, I do not drink. When I attend social functions I volunteer to be the designated driver. I do not object to others drinking as long as they drink responsibly. My personal preference is that for me I do not drink. I do not drink but I have heard that cranberry juice and Stolichnaya makes a refreshing cocktail. John Borst: While I don’t personally drink vodka, but for those who do, try the following: With the splash of lime, the vodka tonic is an easy-to-make, refreshing sipper for really hot days. Where the gin and tonic relies on the flavor of gin to make the drink, this vodka version is very clean and almost flavorless except for the lime. This is where a good vodka comes into play: a value vodka will add nothing to the drink and its impurities will shine through. Also, try this out with any of your favorite flavored vodkas. Sorbets are a great way to cool down in the summer and serve as a light, chilled dessert for brunch and lunch. While they are more time consuming than blended drinks, they are worth every minute of your time. This sorbet is lemon-flavored and spiked with vodka, of which I suggest using a premium brand simply because they taste so much better. Fred Strong: I haven’t made a cocktail since I was a bartender many decades ago. In my case I’d be mixing it with my common sense and ability to think clearly and then disposing of it through my processes and into the sewer. It doesn’t make sense to me but that is a personal choice. Other people may choose differently and may mix other things such as shyness or inhibitions into the cocktail. That is their right as long as they don’t infringe on others’ rights in the process or result. Ed Steinbeck: I do not drink vodka. Donald Fransen: Usually, just ice. Always shaken, not stirred, and never mix vodka with driving. Gary Allen Nemeth: No and I listen to classical music and a variety of jazz. John Borst: I do not presently own an iPod. Jim Norman: No, MP3. Van Halen “Jamie’s Crying;” Iron Maiden “Run to the Hills”; Pantera “Cowboy from Hell”; Beth, Rush, Limelight. Fred Strong: don’t have an iPod. I was a disc jockey in my youth and still occasionally do a mobile DJ gig on request for birthdays, anniversaries, and I’ve done one elementary school dance each year for more than a decade now. Therefore, I have over 5,000 albums; 2,500 45’s; 1,000 CDs and numerous old cassettes. My music choices cover most of the field of music. However, my definition of music may differ from that of some of the much younger generation. Nick Gilman: No iPod handy. Currently “The Story” by Brandy Carlisle, together with any of my Emmy Lou Harris and Bob Dylan collection. Listening is unfortunately infrequent. Ed Steinbeck: No. I do have a multifunction phone/pda that allows music, but I do not have time to use that function. Donald Fransen: no I don’t; I find the radio a little more interactive. Rage against the Machine “Killing in the Name of”; Ray Charles/ Willie Nelson, “Seven Spanish angels”; Lee Ann Womack, “Dance”; System of a Down, “Toxicity” (as performed by Trio International); A-ha, “Scoundrel Days”; and of course, Frank Sinatra. 2002, 2003, 2004, & 2005. Jim Norman: Many. The Boys and Girls Club. Fred Strong: Only one? I have volunteered most of my life. The dance I do for an elementary school is “almost” volunteering. I’ve volunteered for the League of California Cities to serve on committees regarding the development of a statewide model ordinance for cities regarding Transient Occupancy Taxes (TOT), the national Standardized Sales and Use Tax Agreement and its impact on California, the Water Task Force to analyze, comment on and recommend actions regarding the California Water Plan Update 2009, California Water Strategy, AB 2175 and other conservation measures and previously on other climate change, land use and planning matters. I agreed to teach a program at our Senior Center once a week as available. I volunteer for many things. That, in my opinion, is part of citizenship and interacting in a civilized community. As an elected official it is even more important to stay involved with the community and try to prevent those things that could negatively impact it. Nick Gilman: “Paso Robles Mainstreet” volunteered me. I currently co-chair of the design committee for the downtown merchants. The city’s Downtown Plan is getting more serious attention. Ed Steinbeck: Yes. Besides being on the Planning Commission, I am on the board of the Skills USA group at Paso Robles High School. This group helps students that may not be college bound to find and practice a skill such as plumbing, electrical and so on. Donald Fransen: I picked up trash on creek cleanup day. I volunteered to run for city council, acquiring zero donations, [at] zero cost to the community, and [with] lots of encouragement from the community. When volunteered by others, I always come through.